Singapore: A US-China trade war and a further 10% drop in emerging-market stocks might not be the worst things to happen this year, according to Mark Mobius. The veteran investor in developing nations also sees a worldwide financial crisis on the horizon. “There’s no question we’ll see a financial crisis sooner or later because we must remember we’re coming off from a period of cheap money," he said in an interview. “There’s going to be a real squeeze for many of these companies that depended upon cheap money to keep on going." Tighter liquidity as the US Federal Reserve and European Central Bank normalize monetary policy has weighed on emerging markets this year, along with the rising dollar and deteriorating trade backdrop. The dispute between the US and China will probably worsen as President Donald Trump is unlikely to suffer much blow-back from his tariffs, as their inflationary impact will be matched by rising US wages at a time when unemployment is low, Mobius said. 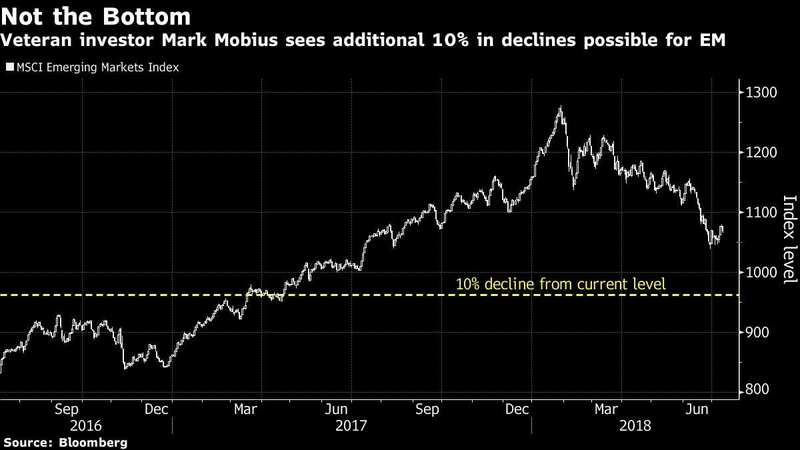 The MSCI Emerging Markets Index will likely fall another 10% from current levels, predicted Mobius, who left Franklin Templeton Investments earlier this year to set up Mobius Capital Partners LLP. That would tip the gauge, which has fallen around 16% from a peak in late January, into a bear market. The MSCI Emerging Markets Currency Index has dropped around 7% from a high in late March, forcing central banks from Turkey to Argentina and Indonesia to raise rates to defend their currencies. The rate hikes may be a “short-term fix," but could be counter-productive for countries with high amounts of debt, Mobius said, adding that governments need to put their finances in order to restore investor confidence. Despite all the gloom, the 81-year-old investor sees the slump as a buying opportunity and is seeking to raise funds.